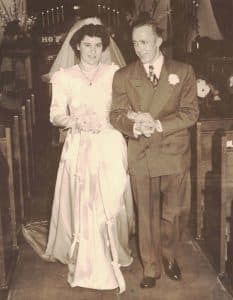 Take Your Life Personally – Kathy J. Marshack, Ph.D.
My parents, Irene and Paul on their wedding day, August 29, 1948. Only a few days ago, I decided that I wanted to dedicate my new websites to people I love and who have inspired my work. The obvious choices are (1) my parents for my life’s work, and (2) my daughters for introducing me to Autism Spectrum Disorder. While countless others helped along the way, sometimes with gentle prodding, soaring speeches, probing discourse, deft editing, and at times painfully searing criticism — it just makes sense to dedicate these two new websites to those I hold dearest in my heart. Love is like that isn’t? It’s a guiding light that shows us the way to our authentic expression of Self. I was taken aback until I realized that he may not understand the “Life of the Personal.” I first learned about this important developmental stage, after the events of Sept. 11, 2001 awakened me to the fact that I needed to take my life more personally — and I haven’t looked back since. Below is an edited excerpt from my book, WHEN EMPATHY FAILS: How to stop those hell-bent on destroying you, where I introduce you to my Empathy Dysfunction Scale (EmD Scale). The book and this blog post are personal and YES! I meant to write them this way. Please take your time to read and absorb all of this, because the bottom line is that if you want to take back your life, and to live it as fully as you can, then you have to take your life personally. “At first the awakening was just emotional, not personal. I knew that something wasn’t right in my world, but I didn’t fully understand what it was I needed to change. “I got an inkling of an idea about my life of the personal when I spent three days in the county jail, following my first false arrest. The obvious is that I recognized it was not going to be so easy to divorce a divorce attorney in a legal system where he held all of the cards. I needed to learn how to stand up for myself and quickly before I lost everything. Not so obvious was the lesson I learned from a tiny pamphlet left in my jail cell by volunteers from Catholic Charities. “Desperate for something to distract me from my plight (and my migraine headache) I read the story of the suffering of Mother Mary as she watched her son Jesus carry his cross to Calvary where he would be crucified. I literally wept with Mary as she described her feelings of anguish, fear and anger. . .but held strong her resolve that the son she bore would die for something far greater for all of us. With my daughters Bianca and Phoebe, on vacation during better times. “Taking one’s life personally means to realize how incredibly important you are. You were born to be You in every way possible. You are an amazing, one of a kind Soul and with every step you take you walk on hallowed ground. There is no way any of us can truly understand the enormity of God’s plan, but to know you are loved is enough. Mother Mary knew this, which is why she could be strong for her son and all of the rest of us who weep at her feet. “In other words, the action plan for taking your life personally is to relax and know that you are an instrument of God’s love for you. Throughout this book you will see me ignore this knowledge, struggle to control the outcome. . . and fail repeatedly, even though I had this lesson early on in my fight against injustice. “I am still learning to take my life personally, to enjoy the beauty of life and to count even adversity as a blessing. (After all, adversities drove me to write this book). 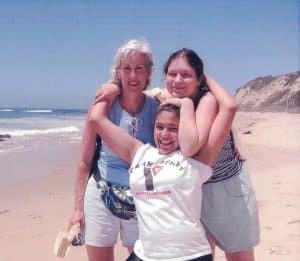 These realizations led me to discover the connection between Empathy and Empathy Dysfunction (EmD). The only way to appreciate this discovery is to take it personally. It is in the Life of the Personal, that we find the resilience to solve the problems we encounter with those having EmD. And it is through that resilience that we can achieve Radiant Empathy. Everything you say resonates with me except for the inclusion of your god. While that doesn’t make me draw away from your blog and helpful group, I realise I have a different concept of being or becoming my best self. I believe that there is value in my existence on this earth simply because I came to exist. I am here to be a human being and my own version of that strives toward making the most of the mind and body I have, within the moderating influence of my changing environment. There is no ideal for me but a fuzzy scale of being less or more worthwhile. This sense of self has only emerged in my 50s after decades of crippling depression and in my encounters with one particular adult “Aspie”. It’s the same thing about the self that I concluded after years of dealing with people with weight/eating disorders; human beings need to be valued from a time even before their conception and infancy so that that they are “OK” with any aspect of themselves that might make them stand out or come to official notice, often purely due to the vicissitudes of life, along with peers and the media in general. A valued person would not feel the need to change their ways of thinking, their body or appearance purely due to outside pressure because they know they have ample value already. Thank you Kay. How hard is it to understand that we are enough? In the very act of making choices, we prove how amazing we are. The freedom to choose is immensely important to our self esteem.